Storm clean-up near us is slow and there’s no word when power will be restored to thousands of homes. Problems in our area are minuscule compared to states on the coast, as well as hard hit countries like Cuba and Haiti. And yet everywhere there’s a crisis, wonderful things are happening. People are freely sharing food, water, and electricity with each other. They are cooking the last of the food from their freezers to offer their neighbors. They’re donating their time to labor on behalf of those they’ve never met. 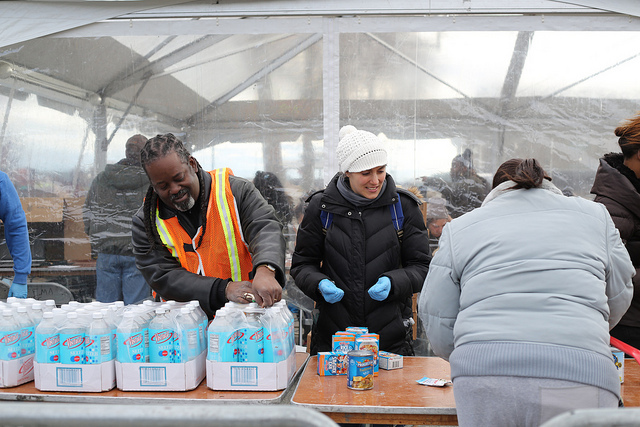 The much-maligned Occupy movement mobilized their networks, getting thousands of volunteers to help out in neighborhoods well before more established organizations like the Red Cross arrived, and is still at work. Hundreds of marathoners, without a race after New York City cancelled the run, jogged through Staten Island on Sunday with backpacks full of supplies to donate. The theater community is sharing equipment and space so that shows can go on. Companies large and small are offering wi-fi, power, and work areas for free. Restaurants are giving away free food, businesses are dropping standard fees, and big companies are stepping up to offer direct help including AT&T now sharing networks with rival T-Mobile. The online community has been busy, passing along information as it happens, and coming up with collaborative solutions. You may have friends or relatives staying with you now. We humans are wired to live in interdependent networks of people based on mutual support and compassion. Ninety-nine percent of humanity’s time on earth took place while we lived as nomadic hunter-gatherers, a time when we did not make war against each other. Anthropologists tell us that our species never would have survived without structuring our lives around sharing food and resources. This responsive caring is basic to who we are. But we’re told people are essentially selfish. Popular culture feeds this concept by elevating what’s superficial and materialistic, the better to shape us into perpetual consumers. Worse, we seem to think that selfishness can easily erupt into brutally dangerous behavior when disaster strikes. According to a remarkable book, A Paradise Built in Hell: The Extraordinary Communities That Arise in Disaster , the opposite is true. Author Rebecca Solnit takes a close look at disasters including earthquakes, floods, and explosions. She finds tragedy and grief, but something else too, something rarely noticed. During and after these horrific crises there shines from the wreckage something extraordinary. Disaster is often compounded by those who believe that human nature is selfish and cruel. In many cases this is the drumbeat sounded by the media and acted on by authorities. An analysis of disasters shows that official efforts to deal with disaster tend to focus on this aspect, suppressing the efforts of ordinary people to reach out while increasing tighter controls. This deprives people of helping one another and compounds the crisis. ← Biodapt Inc. – Finally a Prosthetic Knee That Can Keep Up.